Whether we hold here or not, we have had a nice VIX spike to 53, which historically creates great opportunity. I do so a potentially downside targe of 1820 which would be the OCT 14 retest and worst case Scenario a test of 1750. This would obviosly not be fun if you are currently long. Regardless of all that XIV looks like a good buy, and if we see 1820, I would buy more, and if we see 1750 I would buy the rest. This would set you up for a 2-3 year hold on $xiv which would likely create a simliar buying opportunity that August-october 2011 created. $XIV hit $5 and rallied to $45 in 4 years. If we see 1750 in the SP500 and $xiv lets say hits $15. We could easily see a move back to $50 or $60 when the bull market continues. This is obviosly not a trade. It is a 1000 day hold, but if the opportunity presents itself. You can stop trading. Just hold. It will be worth it. In my opinion that is. I am long $svxy and getting longer over the next couple months. The $spy is now negative on the year about 1% or so at $2040 on the SP500. The 100 Day MA is at 2042. If we can reclaim it within the next two sessions or so I think a short term bottom is in, which can propel us into our next leg higher into May. Watch the action. If we fail to reclaim the 100 day. 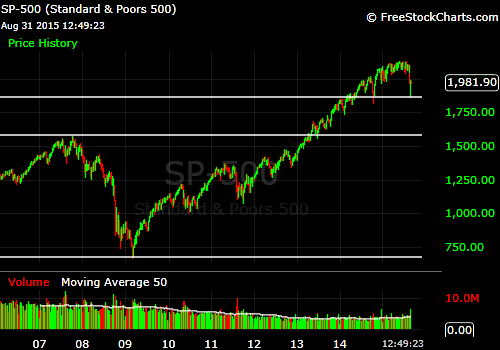 We are very likely to hit $spy 202 and we could fall even as far as $2000 on the SP500. I am long $spy calls for a trade and looking for a bounce here at these levels. $vix is still in pretty steep contango even though it has risen from under $13 to back over $17. Being Long $ziv, essentially puts you short the 4-7 month VIX futures. Being long EDV is essentially long 20 year bonds. What I have come to learn is that ZIV is a much smoother, less volatile, and more predictable ride than XIV which invests in front month VOLATILITY futures. Here is a chart of ZIV and XIV over the last 3 years, since 2011 collapse. You can see that Over a long enough period of time the return is essentially the same. 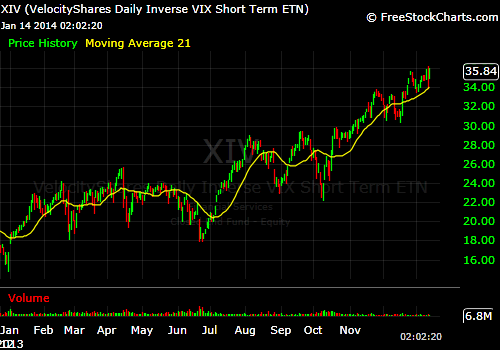 XIV is faster to the downside and faster to the upside. Ziv Is slower to both, but both follow the same trend. OK...So Bonds. What I have learned is that when there is a really big spike in VIX, an event causes the market to sell off, or if the market just decides to go down hard, there is a rush to bonds. Which create a great hedge. 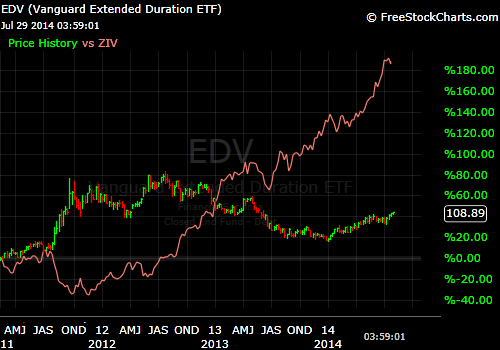 Look at the chart below of $EDV which is the extended duration bond ETF from VANGUARD. As you can see when the market tanked 18% in the summer of 2011, Ziv was hit bigtime, and EDV rallied enough to hedge the entire loss if not create a gain. As you can see, bonds have a long term trend line that is up, but have spike up, every time the market tanks. Very important. Keeping a position in both ZIV and EDV over the last few years (a bull market), you will need to re-balance. VIXTANGO members can feel free to EMAIL and ask question on how to re-balance, how often to re-balance, what percentages to hold, and how to get the best Sharpe ratio in your portfolio. When investing in Leveraged Volatility ETF's, one should rarely make it a hold for more than a few days to a couple of weeks. They suffer from high internal costs & and also from straight up Decay in value. As you can see, long term holders (Only the last 1 1/2 years) have lost 99% of their value and will likely never break even, unless the market drops 50% and the VIX hits 100. Since these trading vehicles invest in front month futures, keeping a 30 day maturity, they are buying more expensive futures every single month, no matter how the previous month fared. As $uvxy and $tvix drop in price each time they then rise they are further and further in the whole needing a larger rally to get back to even. 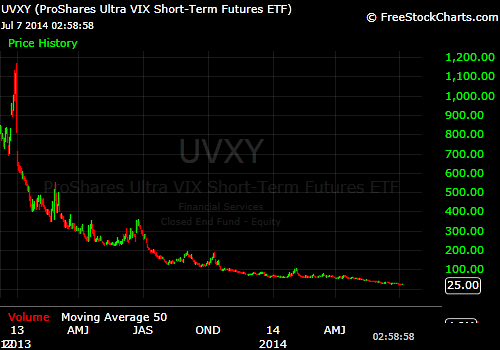 So to break even after buying $UVXY in JANUARY 2013 you would now need a 500% gain from here to get close. These ETF's are constantly losing value if the VIX stays FLAT or if it goes down. They only make money when the VIX rises, which is much less often. SHORTING these leveraged ETF's is a risky thing, but a very profitable trade when done within strict parameters. Join @VIXTANGO to get entries and exits for every single trade and take advantage of these inefficient trading vehicles. These are the Entries and Exits our Volatility Formula generated so far this year. 1 losing trade of little consequence and 6 big winners. Results speak for themselves. Take a look at the chart. Yes 2013 till today. Yes split adjusted $1,100 to $25. CONTANGO at it's FINEST! ENTRIES and EXITS are key. Can get squeezed very easily. Risk Happens Fast. SIGN UP & Follow VIXTANGO! Just because $vix is at some historic low levels does not mean you cannot profit from decay and contango. RISK does happen fast and it is easy to get caught short $vxx and because of that it is a dangerous thing. In a bull market remember any short $vix spike is normally faded pretty hard and can create some easy money shorting $VXX or being long $XIV. Take a look at the chart of $VXX since middle of April this year. The market has been bullish, the VIX has been incredibly low (scary low some think) and $VXX has been paying shorts fat! For entries and exits along with daily ranges please contact me. Take a look at this chart. 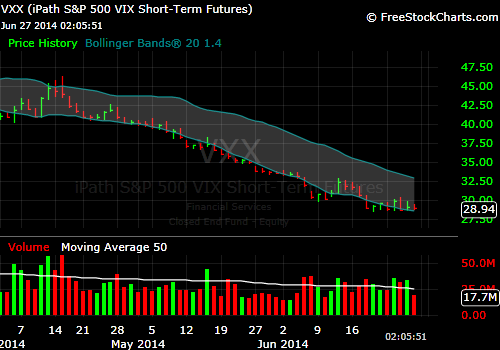 The $vxx is constantly getting crushed due to the fact that the front month $vix futures are always in contango. There are many strategies to sell the $vxx short, but look at this chart and you can likely come up with some good ideas. The move down yesterday in the overall markets provided a good opportunity to take some $xiv or short $vxx $tvix $uvxy exposure. The market overreacted over some taper talk and gave you a spike in the VIX which was making new lows under 12. It closed the day at 13.60 range and today is back flirting with breaking 12 again. This continuously happens in the VIX and we know the best way to play this is through the CONTANGO that is in the VIX etfs! 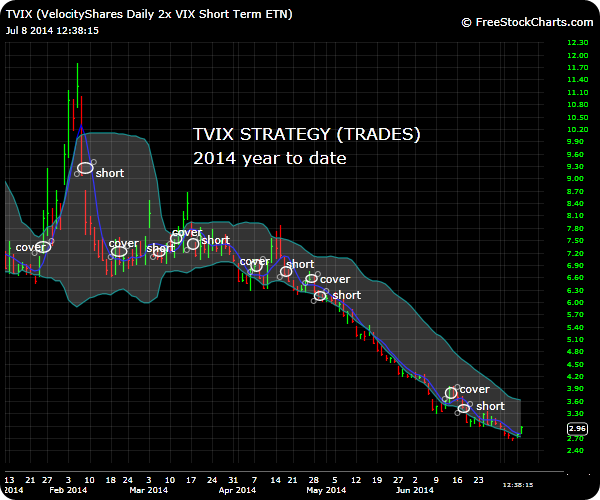 Yesterday I shorted 35% more $tvix to my existing position on that end of the day spike. This morning i took that 35% off for a 6% gain. Be carerful, use stops, do not bet to big or more than you are willing to lose. Shorting these etfs and Being long $ziv and $xiv are by far my most profitable and Predictable gains. Hope you take advantage of them.